At long last, the residents of Canada Water have been graced with a local restaurant to dine in. 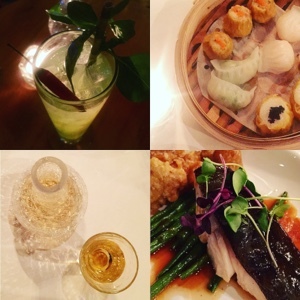 After years of travelling to Canary Wharf to eat out, locals can now visit Tasti, located opposite Canada Water Library, which offers Pan-Asian bar and restaurant offering family friendly fine dinning. We booked a table with Russell's parents last Friday and arrived early to have drinks in the bar. The building is very inviting, with large glass windows overlooking the canal, chic furniture and an industrial vibe that is softened by a large cherry blossom mural. 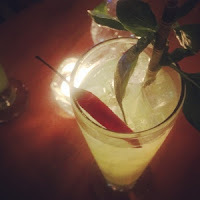 We all agreed that in summer it will become the perfect place for an afternoon tipple, and was surprised to find a large and experimental drinks menu (however it's worth noting there's no beer on draft). After a few drinks the very friendly staffed showed us to our table. 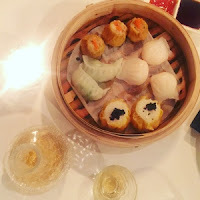 We chose the mixed dim sum to start which was tasty, although for four of us they only bought one dipping sauce, which made sharing a little competitive. 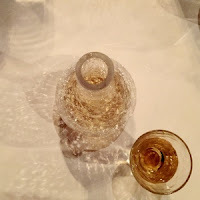 We ordered plum wine and sake to accompany our starter, and I have to say I cannot fault the drinks menu in any way - everything we drunk was enjoyable. After waiting half an hour for our main dishes to be served, and were pretty disappointed when they arrived. 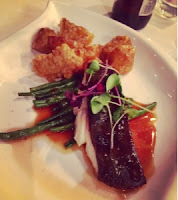 I ordered the Miso Noriko Black Cod with french beans, citrus ponzu and tempura potatoes. At £22 I was expecting a stand out dish, but in reality the cod had no miso, the portion was tiny and I couldn't taste a hint of citrus. More shockingly was the Chicken Rendang that the rest of our table ordered. The dish again was a tiny portion and the chicken was extremely grisly and served with soggy skin - not what we had anticipated at all. In all honesty, we've all eaten better from street vendors at half the price. At nearly £200 for one sharing starter, 4 mains and drinks, we were left rather hungry and disappointed (I'm embarrassed to say we popped two pizzas in the oven when we got home). This restaurant has great potential and I'm sure it will do well once it's better established, however as it is right now I wouldn't recommend returning for dinner.